WOW! Thanks for letting us know. I have had this in the past and am very disappointed. Wish my server had known more about the ingredients and could have told me. Hopefully we can get this changed but it does concern me that I was lied to in the past. It is also true , yet not advertised that the burgers are not grass finished . Seems that burger up is not entirely forthcoming about their ingredients. Thank you. We are on it! Never claimed vegan. Veg, yes. So not true, every time I’ve eaten there I’ve asked if the Marathon was vegan and they’ve said YES! Ugh. No wonder it always made me feel sick. It has been (passively) brought to my attention that the picture you include in this post is not the dubious Marathod Burger from Burger Up. It appears that the photo is from Frothy Monkey, not Burger Up. Hard to tell, it may be a quinoa patty, but the photo is useless. This relegates your post to the same journalistic value as a tabloid, useless. Unattributed quotes, misleading picture…come on. If you’re going to rake a thoughtful, well meaning, locally sourced restaurant over the coals for what amounts to less than microscopic levels of anchovy in a burger that is not even marketed as vegan, then at least get the picture correct. And while we’re at it… Why is it that the entire world must bend to your wants and wishes? When I walk into the Wild Cow, I don’t ask them to supply me with meat options. Why then would you expect a burger restaurant to cater to your very narrow dietary desires? I respect your right to exclude whatever proteins you choose for your diet. Key word being choose. Burger Up has responded, graciously I would say and unnecessarily, to your extortive demands. That kind of “reduce it to the absurd” argument significantly lessens your credibility. Here’s the deal “Steve”, if that’s your real name. I know a lot of Steves. That “Steve” looks much like Steve from Portland, Oregon that works at Stumptown Coffee so I’m not sure you should be using that name. It comes down to being TOLD it was vegan then being served something NOT vegan. Simple as that. 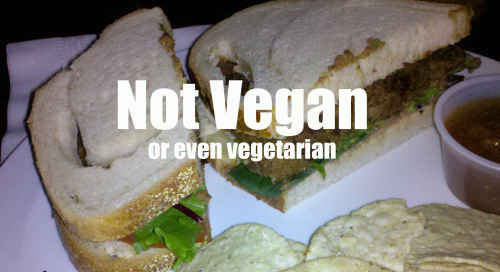 If we were told it was not vegan then it would not be an issue. We would go along our way. Simple. So before you come in here “Steve” get your ducks in a row. I asked as well as did many others and we were told that the Marathon Burger was, in fact, vegan. It goes no further than that. It sounds no more than you being a plant for the restaurant. You sound petty. I’m sure this matters little to other customers of Burger Up. Either they will revise or they won’t. If they don’t, the vegans who once ate the burger will no longer. If they do then vegans will once again visit and dine. Either way, Burger Up will continue to thrive, so do not worry “Steve”. “Extortive demands” Where did I make any type of demand? Extoritve? Reading comprehension, “Steve”. Also, that picture is the burger from Burger UP as they were prepping to open on 12 South. I did a review for it which you would know if you bothered to follow links and read, which you didn’t but hey, what am I supposed to expect from someone who fakes a name, right? In the end, before you decide to come here and “rake me over the coals” for what appears to be something you know little about get some facts regarding vegans, what they eat and more than passive hearsay. Oh, and “Steve”: Thank you so much for the visit and reply. Have a fantastic day!